Rheumatoid arthritis (RA) is an autoimmune/inflammatory disease affecting 0.5 to 1% of adults worldwide and frequently leads to joint destruction and disability. Early diagnosis and early and effective therapy may prevent joint damage and lead to better long-term results. Therefore, reliable biomarkers and outcome measures are needed. Refinement of the understanding of molecular pathways involved in disease pathogenesis have been achieved by combining knowledge on RA-associated genes, environmental factors and the presence of serological elements. The presence of autoantibodies is a distinctive feature of RA. Rheumatoid Factor and Anti-Citrullinated Protein Antibodies are the two most remarkable autoantibodies in RA and provide different clinical and pathophysiological information. They precede the onset of disease symptoms and predict a more severe disease course, indicating a pathogenetic role in RA. Therefore, they promote a more accurate prognosis and contribute for a better disease management. Several RA-associated autoantibody systems have been identified: Anti-Carbamylated Antibodies, Anti-BRAF, Anti-Acetylated, Anti-PAD4 antibodies and others. Hopefully, the characterization of a comprehensive array of novel autoantibody systems in RA will provide unique pathogenic insights of relevance for the development of diagnostic and prognostic approaches compatible with an effective personalized medicine. Rheumatoid arthritis (RA) is an autoimmune/inflammatory disease affecting 0.5 to 1% of adults worldwide . Women are three times more susceptible than men and the disease is more frequent at the age of 40–50 years . RA frequently leads to joint destruction and disability . Early diagnosis and early and effective therapy may prevent joint damage and lead to better long-term results . Optimal management of RA is needed within 3 to 6 months after onset of disease, since substantial irreversible joint damage has been shown to occur within the first 2 years. Therefore, reliable biomarkers and outcome measures are needed in order to establish early diagnosis, assess prognosis, and achieve a better disease management [2, 3]. The etiology of rheumatoid arthritis (RA) is not known, although genetic, environmental factors and serological elements have been identified to play a role in disease initiation and progression . Smoking is now a well-known environmental trigger . Genetic contribution is estimated around 50 to 60% and therefore, genetic factors have an important impact on susceptibility to RA . The strongest predisposing gene variants are found in the human leukocyte antigen (HLA) genes, accounting for 30 to 50% of overall genetic susceptibility to RA . Multiple RA risk alleles within the HLA-DRB1 gene share a conserved amino acid sequence, leading to the “shared epitope” (SE) concept . The presence of one HLA SE allele confers an odds ratio to develop RA around 4, and the presence of two SE copies increases the odds ratio to approximately 11 . The presence of autoantibodies is a distinctive feature of RA. The two autoantibody systems most commonly used as an aid for diagnosing/classifying RA are rheumatoid factor (RF) and anti-citrullinated protein antibodies (ACPA). They precede the onset of disease symptoms and predict a more severe disease course, indicating a pathogenic role in RA. Therefore, they promote a more accurate prognosis and contribute for a better disease management. Their importance was recently emphasized by the inclusion of ACPA alongside the previously included RF on ACR/EULAR 2010 RA diagnostic criteria . The hypothesis that autoantibodies may play a pathophysiologic role has been fueled by the discovery of strong associations linking the HLA-DRB1 SE and PTPN22 alleles, smoking and the presence of autoantibodies, in particular ACPA . Recently, other forms of post-translational modification have been associated with the generation of RA-relevant autoantigens and autoantibodies that can be used as useful biomarkers . In predisposed subjects, failure in keeping self-tolerance might be elicited by post-translational modifications, since these processes might promote generation of neoepitopes and neo-(auto)antigens . This article provides an update on the state of the art on autoantibodies in rheumatoid arthritis (RA). The first autoantibody discovered in RA patients is the RF. It was first described in 1940 as an antibody directed against serum gamma-globulins and promoted the agglutination of sheep red blood cells sensitized by subagglutinating doses of rabbit antibodies . In 1948, these antibodies were described in patients with RA, and in 1952 they were called RF due to their strong association with RA . RF are autoantibodies that directly bind to the Fc portion of the aggregated IgG and are locally produced by B cells present in lymphoid follicles and germinal center-like structures that develop in inflamed RA synovium [10, 11]. RF testing in RA patients has a sensitivity ranging from 60 to 90% and a specificity ranging from 48 to 92%, according to different studies . RF has limited specificity, since it can also be found in healthy controls and patients with other autoimmune diseases such as systemic lupus erythematosus and systemic sclerosis, and in non-autoimmune diseases, such as chronic infections and cancer [4, 10, 12] RF is found in multiple immunoglobulin isotypes (IgM, IgG and IgA) wherein IgM-RF is the one usually measured in most clinical laboratories, being detected in 60–80% of RA patients . The simultaneous occurrence of IgM, IgA, and IgG RF is present in up to 52% of RA patients but in fewer than 5% of patients with other connective tissue diseases. The combined occurrence of IgM and IgA RF has high diagnostic specificity for rheumatoid arthritis, but the presence of IgA and IgG RF isotypes in absence of IgM-RF is less specific, since they are also prevalent in patients with diverse connective tissue diseases [12, 13]. IgM-RF specificity increases considerably at high titres [4, 10, 12]. RF reactivity presents several differences in healthy and RA patients. Healthy subjects usually present poly-reactive, low affinity, low titer IgM class RF, whereas RA patients usually present more than one isotype RF at higher titer and with higher avidity . It has been shown that high titer RF in healthy subjects is associated with increased risk of developing RA . Finally, IgM RF has increased frequency in healthy elderly people, which suggests that they may be also related to the age-related immune deregulation [12, 14]. There is evidence supporting the concept that RF is a pathogenic autoantibody with a key role in the physiopathology of RA . In normal conditions, transient production of low-affinity IgM RF is regularly induced by immune complexes  and polyclonal B-cell activators, such as bacterial lipopolysaccharides and Epstein-Barr virus . The physiological role of RF under normal conditions includes promoting stability of IgG bound to solid surfaces, such as bacterial walls; enhancing immune complex clearance by increasing its stability and size; helping B cells uptake immune complexes, and thereby, efficiently present antigens to T cells; and facilitating complement fixation by binding to IgG containing immune complexes [15, 16]. High affinity and high-titer RF in RA synovial fluid are believed to exert such functions in a pathogenic manner and thus to potentiate inflammation and antigen trapping in the joints . In RA, RF may induce the formation of immune complexes at the sites of synovial inflammation, ensuing the activation of complement and leukocyte infiltration (Fig. 1) . B cells with RF specificity migrate into the synovium of RA patients, presenting a variety of antigens to T cells and this may contribute to the perpetuation of local inflammatory responses and amplification of RF production in the synovium. Thus, RF may prolong B cell survival and hence maintain its own production [11, 15, 16]. RF plays a pivotal role in the differential diagnosis and determination of prognosis of patients with arthritis . It has been shown that RF is useful in predicting the development of RA, as the detection of IgM, IgA, and IgG RF may predate disease onset by years . The pre-clinical appearance of RF isotypes in serum follows a specific sequential evolution: first IgM RF, then IgA RF, and finally IgG RF . High titers of RF have been associated with worse prognosis, more aggressive articular disease, increased disease activity, reduced rates of remission, higher prevalence of extra-articular manifestations, and increased morbidity and mortality, especially when in combination with ACPA [11, 17, 18]. Some studies have shown that immunosuppressive treatment can decrease RF serum levels, but the clinical usefulness of RF in monitoring disease activity and treatment response is limited . Progressive decrease in RF levels parallels the decrease of disease activity in patients treated with conventional disease modifying anti-rheumatic drugs (DMARDs) or biologic agents such as infliximab, etanercept and adalimumab [4, 10]. The published data regarding the potential role of RF in predicting responses to antitumor necrosis factor alpha (TNF-α) in controversial, as one study suggests that the presence of RF predicts a negative response , whereas two other studies show that RF positivity before therapy is insufficient to predict the therapeutic response [20, 21]. It has been reported that high IgA RF pre-treatment levels are associated with a poor clinical response to TNF-α inhibitors . Since high serum levels of RF are predictors of more severe disease forms, it is expected that B cell-depleting therapy can have a beneficial effect. Indeed, RF positivity seems to predict better response to rituximab [10, 15, 16] and to tocilizumab but not to abatacept [10, 22]. The characterization of autoantibodies reacting with citrullinated peptides (ACPA) in RA was first reported in 1998 . However, the history of ACPA starts in 1964 when fluorescence of anti-perinuclear factor (APF) was described in RA sera. Subsequently, anti-keratin antibodies (AKA) that had, as APF, a high specificity for RA, were reported. Over the years, other candidate citrullinated autoantigens have been identified, such as fibrinogen, vimentin, fibronectin and α-enolase . The Sa antigen/autoantibody system was also reported as highly specific for RA. By 1998, van Venrooij’s group was able to demonstrate that the common denominator for several of these autoantibody systems was the reactivity against citrullinated peptides . APF and AKA are related to the citrullinated protein filaggrin whereas Sa is related to citrullinated vimentin . More recently, the term ‘citrullinome’ was used referring to the whole array of citrullinated proteins, 53 in all at this time, identified in sera and synovial fluid of RA patients [16, 23]. ACPA recognize peptides and proteins containing citrulline, a non-standard amino acid generated by the post-translational modification of arginine by peptidylarginine deiminase enzymes, in a calcium-dependent process known as citrullination (Fig. 2a) [11, 16]. Post-translationally modified proteins have been described to be particularly capable of inducing immunological tolerance breakdown and autoantibody response. These modifications are critical for protein structure and biological function . Citrullination occurs during many biologic processes, such as inflammation, apoptosis and keratinization. ACPA are produced by plasma cells in RA joints, and the citrullination of proteins during the inflammatory process seems to play a role in triggering cognate autoantibody production. Several citrullinated proteins can be found in RA synovium, however, fibrin is the major citrullinated protein in RA joint [11, 16]. ACPA are detected in approximately 2/3 of RA patients with a diagnostic specificity of 98% . In the natural history of RA, ACPA immune response starts several years before diagnosis of the disease and the onset of symptoms, but in a restricted manner with low antibody titers and limited peptide reactivity. Fine specificity and epitope spreading, increase in titer, isotype switching and maturation of response gradually occur along the years towards the clinical onset of disease and tend to persist in the majority of patients. This evolution is associated with increase in the diversity of antibody structure that may result in the activation of more immune effector mechanisms . Importantly, the rate of seroconversion of ACPA-negative early inflammatory arthritis (or early RA) to ACPA-positive disease is very low, thus suggesting that repeated testing during follow up may not have an added value . In arthralgia patients, the development of arthritis is predicted not only by the presence of ACPA, but also by their levels . High titer ACPA is also associated with the recognition of several citrullinated epitopes. Patients with arthralgia who have an extended ACPA repertoire are at higher risk of developing arthritis . These findings are consistent with the notion that a broader ACPA recognition profile is associated with higher probability for the transition towards disease [25, 27]. ACPA can be present in different isotypes: IgG, IgA, IgM and IgE. In ACPA-positive patients with RA, IgG1 and IgG4 ACPA are usually present in almost 99% of patients, followed by IgG2 and IG3 in 80 and 60% of patients, respectively. IgM and IgA are present in around 60% of patients [12, 13, 25]. The fine specificity and isotype usage of ACPA in health and disease differs. Healthy family members of patients with RA have fewer ACPA isotypes than their relatives with the disease [10, 14]. The ACPA isotype distribution does not seem to significantly expand anymore during disease progression from undifferentiated arthritis to RA, indicating that most of the expansion of ACPA isotype happens before the onset of arthritis. Indeed, ACPA-positive patients with symptoms of RA for less than 12 weeks show no difference in the specificity and isotype repertoire of their ACPA response compared with patients with longer symptom duration . Importantly, the number of isotypes used by ACPA also associate with RA prognosis, as the magnitude of the ACPA isotype profile at baseline reflects the risk of future radiographic damage, showing an odds ratio of 1.4-fold increase for every additional isotype [24, 28]. In patients with RA, ACPA do not show avidity maturation during longitudinal follow up. In fact, even in patients who displayed extensive isotype switching, ACPA avidity was relatively low. This data shows that there are intrinsic differences between the dynamics of development of RA-specific autoantibodies and protective antibodies against pathogens . The first enzyme-linked immunosorbent assay (ELISA) using citrullinated peptides (derived from filaggrin epitopes) was developed in 1988, which within 2 years was followed by the development of an ELISA based on artificial cyclic citrullinated peptides (CCP) . The CCP2 assay, the first commercial version of this test, became available in 2002 and allowed the widespread routine testing for antibodies directed against citrullinated epitopes as a biomarker for RA . The CCP2 peptides ensure the detection of a broad range of antibodies to citrullinated host proteins and proved to be extremely specific (98%) for RA, displaying a significantly higher specificity in comparison with the IgM RF . The overall sensitivity of anti-CCP2 assays is similar to that of RF (60–80%), but anti-CCP2 antibody is positive in 20–30% of RF seronegative patients . Other assays for detecting ACPA were subsequently developed, such as CCP3 and MCV (Mutated Citrullinated Vimentin), with slight differences in terms of specificity and sensitivity . CCP3 is based on ELISA using a collection of citrullinated peptides by a manufacturer distinct from the one that developed CCP2. Citrullinated vimentin has been identified as potential genuine autoantigen in the pathophysiology of RA, what has triggered the development of an ELISA assay for the detection of antibodies directed against mutated citrullinated vimentin (anti-MCV) . Anti-MCV is a further development of the protocol for detecting antibodies to naturally citrullinated vimentin (Sa antigen) . Studies show that anti-MCV assay does not appear to provide additional diagnostic performance over anti-CCP in RA patients . However, when patients with early RA are compared with healthy controls, it has been reported that analysis of anti-MCV yields greater sensitivity and unchanged specificity as compared with anti-CCP2. Besides, anti-MCV appears to perform better than anti-CCP2 in identifying poor radiographic prognosis in patients with early RA . There is still conflicting data regarding the diagnostic and monitoring value of anti-Sa antibodies. A recent study aiming to evaluate the prevalence and diagnostic significance of anti-Sa compared with anti-CCP2 did not demonstrate any additional diagnostic value of the anti-Sa autoantibody in comparison to the anti-CCP2 . Despite high specificity (92–98%), anti-Sa antibodies showed a low diagnostic sensitivity (between 31 and 44%) . However, it has also been suggested that the combined application of anti-CCP 2 and anti-Sa tests can improve the laboratory diagnosis of early RA, with a high specificity (99.4%), albeit with low sensitivity (50%) . It has been shown that, the recently described anti-CarP antibody correlates with anti-Sa antibodies in RA. The association of anti-CarP with anti-Sa antibodies could not be explained by cross-reactivity and this finding is interesting since both autoantibodies are associated with radiographic progression. Therefore, co-expression of anti-CarP and anti-Sa may be confounding these reports. On the other hand, presence of both of them may be associated with improved ability to predict erosive RA . The CCP3 was developed by a distinct company from anti-CCP2 and does not represent a traditional technical upgrade. Despite some controversy in the literature, there seems to be no argument for superiority of one over the other one. One study showed a significantly higher sensitivity for anti-CCP3 in testing RF-negative RA as well as the total RA population . Recently, differences in the test performances accordingly to the moment of the natural history of RA were reported: in patients with established RA, CCP2 was more specific, whereas in subjects with undifferentiated inflammatory arthritis, CCP3 had a higher predictive value for development of RA . The identification of ACPA has been a major breakthrough in the advancement of the understanding of the pathogenesis in RA. ACPA-positive and ACPA-negative disease have been shown to be associated with different genetic and environmental background, and therefore, different pathophysiological mechanisms should underlie these two separate disease subsets . RA patients exhibit an abnormal humoral response to citrullinated proteins, which are expressed in any form of inflammation, in the synovium or elsewhere . Normally, citrullinated proteins are regularly degraded and do not elicit any relevant humoral reaction of the immune system, therefore the presence of citrullinated proteins per se will not necessarily lead to chronic inflammation . Citrullination has been reported to be a process present in a wide range of inflammatory tissues, suggesting that this is an inflammation-associated phenomenon that should be normally tolerated by the immune system. In fact, it has been widely demonstrated that the presence of citrullinated proteins is not specific for rheumatoid synovial tissue; rather, they can be observed in synovial tissue of patients with other arthropathies and in tonsils from patients with chronic tonsillitis, multiple sclerosis and type 1 diabetes . Citrullination also seems to be implicated in several physiological processes, such as cell death pathways, in which intracellular calcium concentration raises to higher levels than in physiologic conditions, activating peptidylarginine deiminases (PAD) enzymes during apoptosis. Immune cells infiltrating the inflamed tissue contain PAD enzymes. PAD activation due to high intracellular calcium concentration during cell death would promote citrullination of target antigens. Normally, the generated apoptotic bodies are rapidly removed by phagocytes, preventing inflammatory reactions. Any dysregulation of apoptosis or an ineffective clearance of apoptotic cell remnants may be involved in the breakdown of self-tolerance due to accumulation of dying cells and consequent accessibility of intra-cellular antigens. This scenario would promote the meeting of citrullinated proteins with the immune system leading to autoantibody generation in genetically predisposed individuals. This will ultimately result in immune complex formation, followed by upregulation of pro-inflammatory cytokines, which are regarded as the driving force of the chronic inflammation that is typical of RA (Fig. 3) . Genetic factors, such as the HLA-DRB1 SE alleles, environmental factors, such as smoking and hormone levels, and the possible contribution of bacterial PAD enzymes might participate in this mechanism [5–7]. The development of an autoimmune response against citrullinated epitopes is facilitated by specific genetic predisposition. The presence of particular HLA-DRB1 alleles (“shared epitope”-SE) in RA patients contributes to the development of anti-CCP antibodies [3, 7, 8]. Carriage of SE alleles or the R620W allele of the general autoimmunity marker tyrosine phosphatase non-receptor type 22 (PTPN22) in smokers increases susceptibility to RA since SE related HLA binds citrullinated peptides more strongly and the R620W PTPN22 allele stimulates an exaggerated T cell response . This T cell response may drive increased autoantibody production by B-cells, including ACPA [5, 7, 9]. Intriguingly, the strong association between SE-encoding HLA-DRB1 alleles and RA is only observed for ACPA-positive disease [6, 9]. Periodontitis is associated with increased risk for RA. The presence of periodontitis in patients with RA has been associated with seropositivity for RF and ACPA . Porphyromonas gingivalis, a microbe that is the major causative agent for periodontitis, is the only prokaryotic organism expressing PAD, and can cause microbial and host protein citrullination . Hypothetically, this may trigger an immunological response to citrullinated proteins in a subset of RA patients with periodontitis carrying SE alleles . Just like chronic exposure to citrullinated proteins at periodontal sites could contribute to the breakdown of immune tolerance to citrullinated epitopes, chronic inflammation in the lungs from smokers may also predispose susceptible individuals to the development of ACPA and prime individuals to the development of RA . The presence of ACPA before signs of inflammation in joints suggests that immunity against citrullinated proteins is initiated outside the joint . 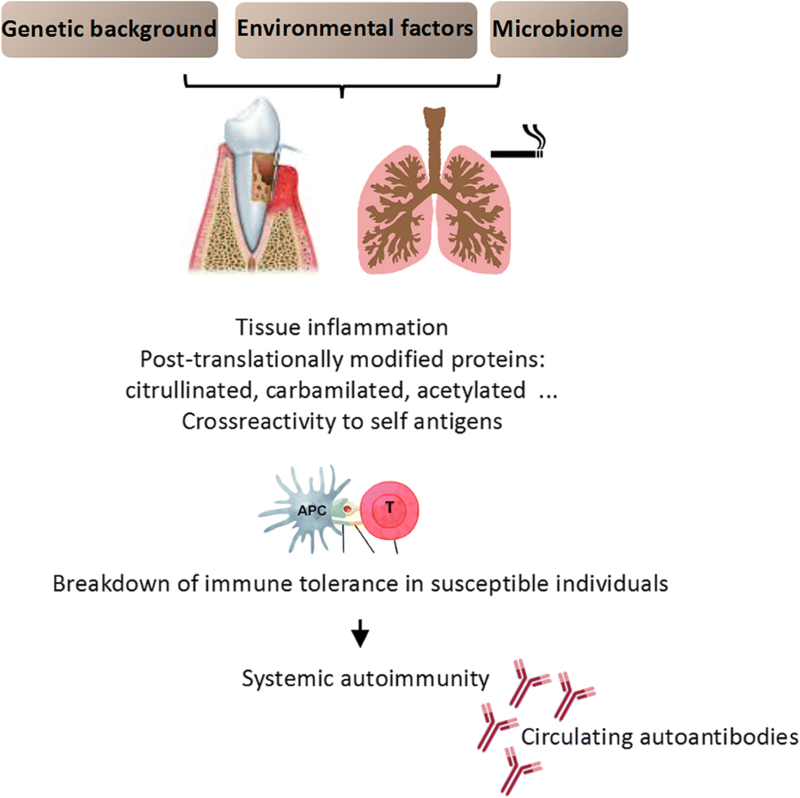 Recent studies suggested that the lung is involved in the citrullination of proteins and may contribute for the generation of RA-related autoimmunity. Smoking has been shown to enhance PAD expression in bronchi-alveolar lavage cells with consequent generation of citrullinated proteins that may lead to citrulline autoimmunity in genetically susceptible RA subjects . It was also shown that local production of ACPA can occur in lungs of patients with RA. Therefore, the lung might be a site of priming the immunity to citrullinated proteins (Fig. 4) . Once generated, ACPA can induce damage as they activate the classical and alternative complement pathways. ACPA are also capable of triggering immune cell responses via Fc receptors (FcR). Immune complexes containing ACPA and citrullinated fibrinogen have been shown to induce TNFα secretion via engagement of FcR on macrophages . ACPA bind to osteoclast surfaces, resulting in osteoclastogenesis and bone degradation . 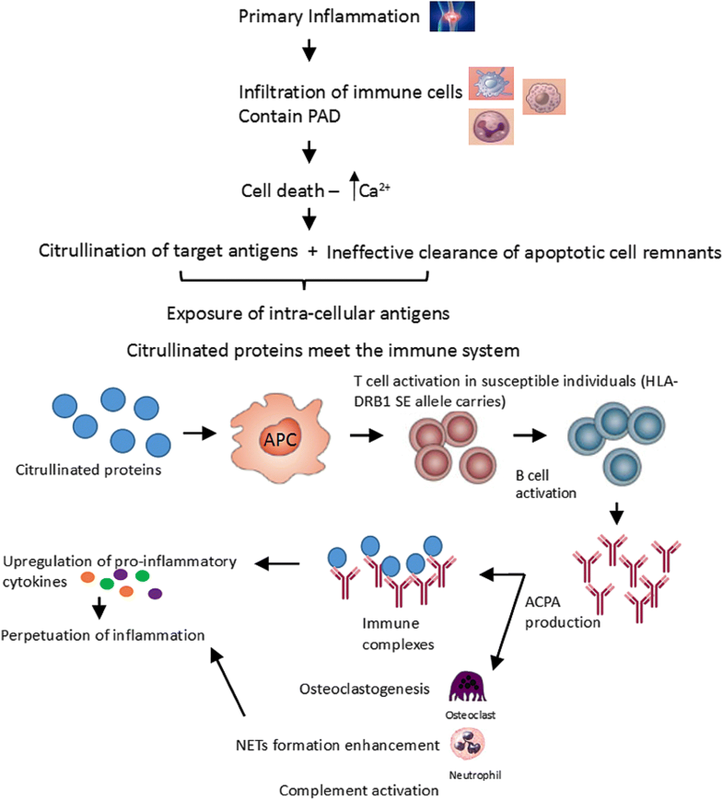 Another mechanism by which ACPA mediate pro-inflammatory action may be through neutrophil extracellular traps (NET). ACPA can enhance the formation of NET, resulting in expel of immune-stimulatory molecules together with strongly immunogenic citrullinated autoantigens. These observations suggest a mechanism that may promote and perpetuate disease (Fig. 3) [24, 25]. The presence of both RF and ACPA is associated with increased systemic inflammation and disease activity in RA . The combined presence of IgM-RF and ACPA mediates increased pro-inflammatory cytokine production in vitro . RF seems to preferentially interact with hypoglycosylated IgG and ACPA IgG is hypoglycosylated as compared with total IgG. It is suggested that IgM-RF enhances the capacity of ACPA immune complexes to stimulate macrophage cytokine production, therefore providing a mechanistic link by which RF enhances the pathogenicity of ACPA immune complexes in RA . ACPA are detected in serum samples up to 14 years before onset of the first symptoms of RA and IgM-RF up to 10 years . The presence of ACPA is associated with more severe joint destruction and ACPA-positive patients develop erosions earlier and more abundantly than patients without ACPA [1, 9]. It is also associated with greater disease activity and poorer remission rates . In addition, the extra-articular manifestations that often determine the severity and comorbidity of RA are also closely associated with ACPA positivity . Both ACPA and RF have been found to associate with cardiovascular disease and mortality in RA patients . Their presence predicts progression towards RA in patients with undifferentiated arthritis and high levels are indicative for arthritis development in arthralgia patients . ACPA positivity is also associated with the presence of RF and SE [29, 36]. Combination analysis showed independent additive effects of these three factors for high radiological risk . It has been shown that anti-CCP2 has higher positive predictive value for erosive RA than RF, C-reactive protein (CRP), erythrocyte sedimentation rate (ESR) or matrix metalloproteinase-3 (MMP-3) serum levels . ACPA-positive patients seem to respond better to treatment than ACPA-negative RA patients in an early phase of the disease, but achieve drug-free remission less frequently . ACPA-positive patients with undifferentiated arthritis (UA) benefit from treatment with methotrexate being less likely to progress to RA, and doing so at a later time point, as compared with a placebo control group. In addition, fewer patients under methotrexate show radiographic progression over 18 months. In contrast, no effect of methotrexate therapy on progression to RA was observed in the ACPA-negative group . ACPA-positive patients, with low and intermediate pre-treatment levels of ACPA respond better to methotrexate treatment in recent-onset cohorts, whereas high levels are associated with an insufficient response. Therefore, in patients with high ACPA levels, methotrexate monotherapy might be insufficient . In the BeSt study, ACPA-positive patients initially treated with DMARD monotherapy had greater radiographic joint destruction after 2 years than ACPA-negative patients. However, when patients were treated initially with combination therapy (DMARD plus anti-TNF biologicals), no difference regarding joint destruction was observed between ACPA-positive and ACPA-negative patients. These observations suggest that ACPA-positive patients, especially those with high titer ACPA, require an aggressive initial approach in order to prevent radiographic progression . ACPA titers can decrease over the course of disease when patients have a good response to therapy. DMARD induce a reduction of 25% or more in ACPA titers in half of the patients over the course of treatment . Regarding response to TNF inhibitors, one study has shown that the presence of ACPA was associated with reduced response to those agents . Other studies show that response to TNF inhibitors is associated with lower ACPA baseline titers and that there is around 30% reduction of serum ACPA titers after anti-TNF treatment . However, several other reports showed little or no effect of anti-TNF therapy on ACPA titers . Other immunobiologicals, such as abatacept, reduce CD20+ B cells in the synovial membrane of RA patients and the production of IL-2, IL-17, IL-22 in ACPA-positive but not in ACPA-negative RA patients [42, 43]. In these studies, anti-CCP2 positivity has been associated with EULAR response, suggesting that abatacept is more efficacious in ACPA-positive RA patients. Rituximab is associated with good to moderate EULAR response in ACPA-positive patients or in patients with high ACPA levels. Anti-CCP2 antibody levels after rituximab therapy present a more pronounced fall in responders relative to non-responders . These data indicate that ACPA status may be relevant for treatment decisions in RA and support the hypothesis that RA can be classified into two different disease subsets: ACPA-positive and ACPA-negative RA . Recently, a new autoantibody system has been described in RA, characterized by antibodies against carbamylated proteins, i.e., proteins that contain homocitrulline residues (anti-CarP antibodies). Antibodies in the serum of RA patients can discriminate citrullinated and carbamylated antigens and, therefore, this antibody system is independent from ACPA. In fact, anti-CarP antibodies may be detected in ACPA-negative patients and vice-versa [4, 45]. Carbamylation is defined as a post-translational modification in which a positively charged amino acid is replaced by a neutral amino acid. The most common carbamylation process refers to the conversion of lysine into homocitrulline. The chemical structure of homocitrulline resembles citrulline. Homocitrulline is one methylene group longer than citrulline (Fig. 2b) [40, 45, 46]. In contrast to citrullination, carbamylation is a non-enzymatic chemical reaction involving cyanate in the conversion of lysine into homocitrulline. Cyanate is naturally present in the several body fluids and in equilibrium with urea . Under physiological conditions, the cyanate concentration is too low to allow extensive carbamylation of proteins. However, several conditions such as renal disease, inflammation and smoking can shift the balance towards predominance of cyanate over urea. In renal failure, the urea concentration increases, resulting in extensive carbamylation of proteins . Smoking also increases the cyanate concentration and can enhance carbamylation. However, most carbamylation is believed to take place under inflammatory conditions, when myeloperoxidase (MPO) is released from neutrophils, converting thiocyanate to cyanate, an essential driver for carbamylation . As a consequence of excess carbamylation, protein and cellular dysfunction may occur, leading to systemic effects . Decreased functional activity upon carbamylation has been reported for several enzymes and hormones. 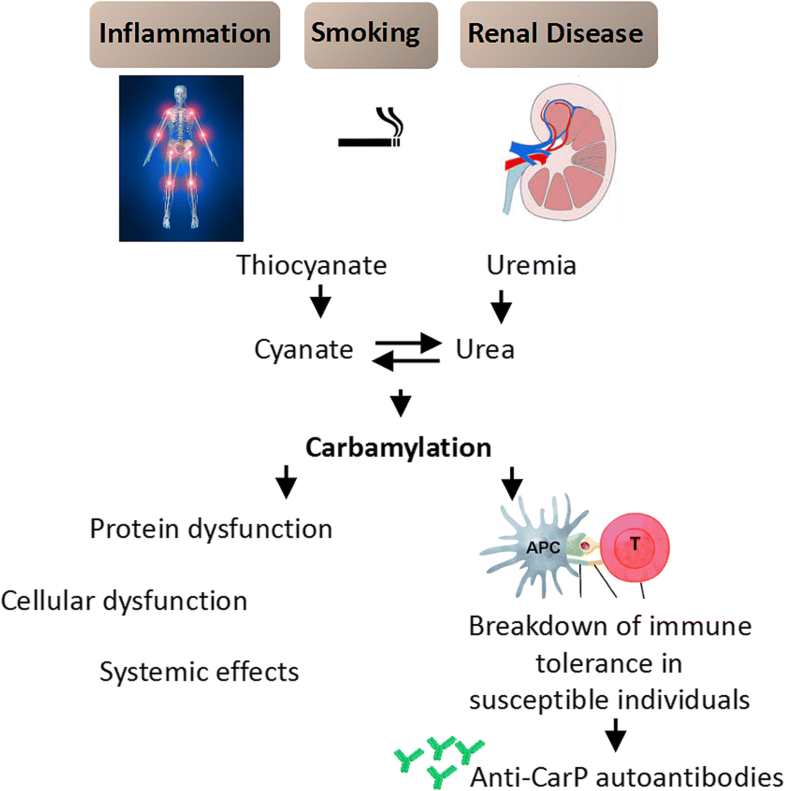 In susceptible individuals, extensive carbamylation will provide the trigger for the development an autoimmune response directed against carbamylated proteins (Fig. 5) . In animal model, it has been shown that carbamylated proteins can trigger primary immune responses, inducing chemotaxis, T cell activation and antibody production, and subsequently, the production of IFN-γ, IL-10 and IL-17. The activation of T cells added to a strong antibody response will enable the recognition of carbamylated and citrullinated peptides within the joints, which may contribute to the development of erosive arthritis. Carbamylated and citrullinated peptides complement each other in the generation of the autoimmune response. The immune-activating effects of carbamylation enhance the arthritogenic properties of citrullinated peptides, therefore providing a novel mechanism for the pathogenesis of autoimmune arthritis . Anti-CarP antibodies are detected in up to 45% of RA patients (45% IgG and 43% IgA anti-CarP). Notably, anti-CarP antibodies may occur in 16–30% of ACPA-negative patients (16% IgG and 30% IgA anti-CarP) . Anti-CarP IgG antibodies seem to be associated with a more severe radiological progression in ACPA-negative RA, indicating that anti-CarP antibodies are a unique and relevant serological marker for ACPA-negative patients . Recently, the presence of anti-CarP antibodies was associated also with higher disease activity and significantly more disability over time in patients with rheumatoid arthritis. Statistically significant associations were seen not only in ACPA-positive but also in ACPA-negative patients . These autoantibodies can be detected more than 10 years before disease onset, at the same time of ACPA and before IgM-RF [4, 49]. The presence of anti-CarP antibodies of patients with arthralgia predicts the development of RA independently of ACPA . Therefore, anti-CarP antibodies might be a useful biomarker to identify ACPA-negative “pre-RA” patients and newly diagnosed RA patients who require early and aggressive clinical intervention [45, 49]. The high specificity of anti-CarP antibodies for RA was suggested as these antibodies were not found in patients with other inflammatory rheumatic conditions or in normal healthy individuals . However, one study showed that anti-CarP antibodies are detectable in the serum of patients with active PsA and correlations between anti-CarP levels and disease activity were observed in polyarthritis patients that were negative for ACPA and RF. If confirmed, anti-CarP may be considered as the first evidence of the presence of autoantibodies in PsA . Anti-CarP antibodies can also be found in juvenile idiopathic arthritis (JIA) patients. It has been shown that 16.7% of JIA patients are positive for anti-CarP, whereas only 6.4% are positive for ACPA and 8.1% for IgM-RF . Genetic and environmental associations have not yet been investigated thoroughly, but one study showed that there were no significant associations between anti-CarP antibodies and smoking, PTPN22 alleles or HLA-DRB1, with the exception of the association identified for HLA-DRB1*03.. The lack of association with SE-HLA alleles may indicate a different biological mechanism for the formation of anti-CarP antibodies in comparison with the development of ACPA and may represent an opportunity to identify additional molecular pathways involved in RA pathophysiology . PAD4 is a calcium dependent peptidylarginine deiminidase, one of the proteins that are responsible for the conversion of arginine into citrulline . It has been recently demonstrated that PAD4 may undergo auto-citrullination, a process that might inactivate the enzyme as a mechanism of control. PAD4 citrullination modifies the structure of the enzyme, increasing its recognition by human autoantibodies [9, 54]. In fact, autoantibodies directed against PAD4 have indeed been identified in RA patients . These antibodies not only target but also activate PAD, increasing the catalytic efficiency of the enzyme by decreasing its requirement for calcium . Anti-PAD4 antibodies have been reported to have predictive and prognostic value in RA patients . PAD is found also in Porphyromonas Gingivalis (PPAD) However, recent data showed that PPAD expressed by P gingivalis is not citrullinated and PPAD citrullination is not recognized by anti-PAD antibodies in RA. Besides, anti-PPAD antibodies were not associated with ACPA levels and disease activity in RA and seem to have a protective role for periodontitis development in RA patients . Anti-PAD4 antibodies are present in 22–45% of RA patients and can also be detected in 14% of SLE patients, but spondyloarthritis patients do not seem to have these autoantibodies . It has low specificity for RA diagnosis (< 50%) . Anti-PAD4 antibodies are almost exclusively found in people with established RA and have been associated with severe disease in these patients . These antibodies are associated with the presence of ACPA and are usually detected after ACPA appearance . A specific group of anti-PAD4 antibodies cross-reacts with anti-PAD3 antibodies. This subset increases the catalytic capacity of PAD4 by decreasing its calcium requirement for citrullination. These antibodies are present in 12 to 18% of RA patients and its reactivity has been found only in anti-PAD4 positive RA patients. Importantly, these cross-reactive antibodies were associated with radiographic damage severity . In addition, the prevalence and extent of interstitial lung disease was found to be higher among RA patients with anti-PAD3/4 cross-reactive antibodies . Therefore, anti-PAD3/4 antibodies may serve as biomarker for disease prognosis, despite being detected at low frequency in RA patients . BRAF (v raf murine sarcoma viral oncogene homolog B1) catalytic domain is a serine-threonine kinase that regulates the mitogen-activated protein kinase (MAPK) signaling pathway implicated in the production of pro-inflammatory cytokines. Anti-BRAF autoantibodies activate BRAF kinase activity, which may lead to production of pro-inflammatory cytokines and joint inflammation . Anti-BRAF antibodies are present in 21–32% of RA patients. These autoantibodies are present also in SLE and primary Sjögren’s syndrome in a similar frequency to RA, and also in 4% of ankylosing spondylitis patients and 6% of healthy individuals [4, 54]. Although not specific for RA, anti-BRAF may be an interesting new autoantibody to identify ACPA-negative RA patients since 30% of anti-CCP2 negative RA patients were positive for anti-BRAF antibodies . RA-33 is an intracellular molecule that binds to the heterogeneous nuclear protein (hnRNP) A2, a part of the splicosome. Anti-RA-33 antinuclear antibodies are present in one third of RA patients. The reported frequency of anti-RA-33 antibodies is 13% in ACPA/RF-negative patients and 9% in non-RA patients. Anti-RA33 antibodies may not be useful as a clinical biomarker for diagnosing RA, however anti-RA33-positive patients seem to show a less severe disease so that these antibodies might serve as a prognostic marker for less aggressive disease . Post-translational modifications due to lipid peroxidation can result in the presence of malondialdehyde (MDA) and malondialdehyde-acetaldehyde (MAA)–adducts. It was found that both MAA adducts and antibodies directed against these adducts were increased in the serum of RA patients, and a positive correlation between the presence of ACPA and anti-MAA antibodies was observed . However, anti-MAA antibodies have also been detected in chronic liver diseases and in type 2 diabetes . Antibodies against MDA-adducts, especially MDA-LDL, were found to associate with cardiovascular problems in RA patients. Acetylation is a reversible enzymatic process where acetyl groups are added to free amines of lysine residues by Lys acetyltransferases (KAT) . Acetylated lysine resembles homocitrulline, but the side chain terminal amine is replaced by a methyl moiety in acetylate lysine (Fig. 2c) . Protein lysine acetylation is a key post-translational modification in cellular regulation, especially in histones and nuclear transcription regulators. Acetylation of cytoplasmic proteins regulates metabolic pathways and enzymatic functions . IgG and IgA antibodies against acetylated vimentin peptides were detected in 35% of patients with early arthritis. However, data showed that anti-acetylated vimentin antibodies are relatively poor for predicting the development of anti-ACPA-negative RA. Their presence and frequency in established RA and their role in predicting disease severity and other clinically relevant outcomes in patients with RA remain to be established . Other less well-studied autoantibodies have been reported in RA. Autoantibodies against transthyretin, a hormone carrier, were found to be increased in RA patients when compared to healthy controls . Antibodies against the hinge region of immunoglobulins, anti-hinge antibodies (AHA), have been reported in approximately 15–20% of RA patients. Despite low sensitivity, they seem to have high specificity for RA. ACPA antibodies may be fragmented by inflammation-associated proteases in the hinge region, creating novel epitopes that can be recognized by the immune system, resulting in AHA. These autoantibodies could modulate arthritis by binding to fragmented autoantibodies in the inflamed joint, which may lead to exacerbation of disease . Several RA-associated autoantibody systems have been identified and many of these autoantibodies recognize post translationally modified proteins, indicating the immunogenicity of such proteins for human B cells. RF and ACPA are the two most remarkable autoantibodies in RA and provide different clinical and pathophysiological information. ACPA exhibit high sensitivity with the highest predictive value for RA development and severity. These autoantibodies enabled the stratification of RA in ACPA-positive and ACPA-negative disease phenotype, with different genetic and environmental contribution factors. In addition, ACPA status predicts response to therapy. However, despite the diagnostic value of RF and ACPA, more serological markers are needed in order to improve early diagnosis and treatment of the patients as well as to lead to a better understanding of the molecular pathways involved in RA. Recently, the identification of anti-CarP antibodies, also present in the serum of RF-negative/ACPA-negative RA patients filled another gap in the seronegative RA spectrum, and indicated further heterogeneity among RA patients. Hopefully, the progressive characterization of a comprehensive array of novel autoantibody systems in RA will provide unique pathogenic insights of relevance for the development of diagnostic and prognostic approaches compatible with an effective personalized medicine.